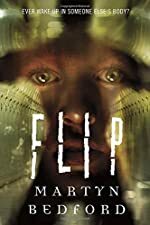 Review: Flip by Martyn Bedford is an amazingly suspenseful book that is packed with marvelous description. This book is a fantastic book for readers who enjoy extraordinary happenings. Martyn Bedford has created a spine tingling story that keeps the reader going through the book. 14 year old Alex wakes up one school day, but not in his body. What he does and what he learns may cause nightmares. Alex wakes up on the wrong bed in the wrong room in the wrong house. His first thought is that he is in his best friend's house, David. Suddenly he hears the noise of a lady calling him down using the name "Philip." When he looks down, he sees that he is not in his body! He goes to school as Philip Garamond, but he is clueless. On the first day, he takes some of Philip's money and goes to the train station where he is caught by one of Philip's school teachers and is taken to school. There he is forced to go to classes and deal with Philip's friends and even more complicated his two girlfriends. In his attempts to contact home, he learns that his real body is in a coma. Desperately, Alex searches the web for answers to the body switch. He learns that Philip and he were both born on the same day, in the same hospital, at the same time. He finds a solution. Alex is one of the many people who have had their souls switched! But, the question is . . . can he get it back? Martyn Bedford has nailed this thriller with a soul whose will to live has no limit. The details on every page give you the feeling that you are a part of the journey. This book traps you in its suspense and keeps you reading from the first page. The characters in this book are also very interesting because with the problem of a different body Alex also has to deal with his love life which I think is a fantastic twist. I think Martyn Bedford really captured the essence of teenage life in this book and expressed the problems in a great way. The writing in Flip is very creative, and this creative plot makes this book better than many. The way Alex thinks changes throughout the story like a child growing and developing. He goes from wondering if he should attempt to go back and risk a life or if he should live in the body he now inhabits. To conclude, the ending of this book is very captivating like the grand finale of a firework show. At this point there is no stopping until the book is complete. All the major events lead up to an amazing climax which is unpredictable. Readers will race to the end, but I hope Martyn Bedford's creative writing does not. We would like to thank Random House for providing a copy of FLIP for this review. Have you read FLIP? How would you rate it?